Explanation: Like grains of sand on a cosmic beach, stars of the Triangulum Galaxy are resolved in this sharp mosaic from the Hubble Space Telescope's Advanced Camera for Surveys (ACS). The inner region of the galaxy spanning over 17,000 light-years is covered at extreme resolution, the second largest image ever released by Hubble. At its center is the bright, densely packed galactic core surrounded by a loose array of dark dust lanes mixed with the stars in the galactic plane. Also known as M33, the face-on spiral galaxy lies 3 million light-years away in the small northern constellation Triangulum. Over 50,000 light-years in diameter, the Triangulum Galaxy is the third largest in the Local Group of galaxies after the Andromeda Galaxy (M31), and our own Milky Way. Of course, to fully appreciate the Triangulum's stars, star clusters, and bright nebulae captured in this Hubble mosaic, you'll need to use a zoom tool. Are all the "big" stars here part of the Milky Way? 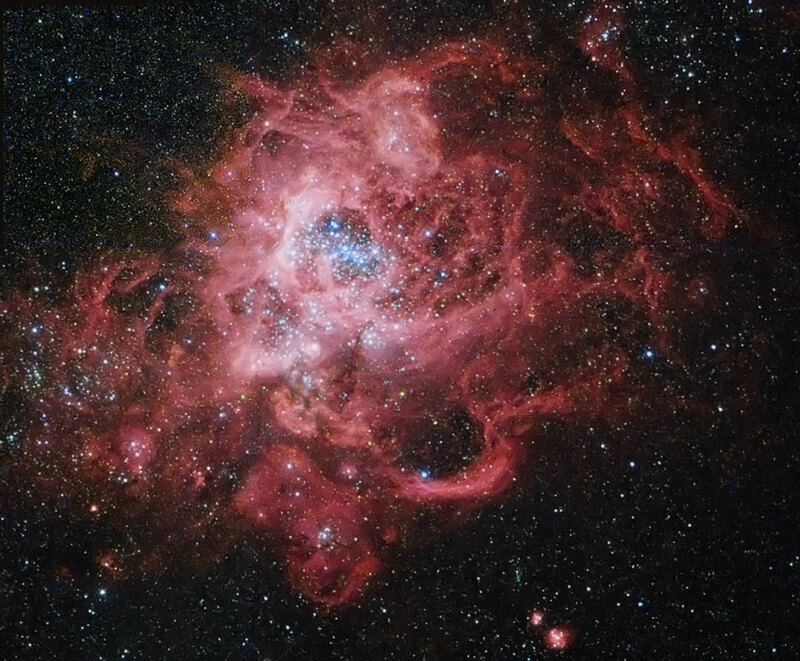 There's one bright one coincidentally appearing very near the center of M33 ... that's not in M33 right? Here is my shot with my 6" Celestron Evolution...not as bright...I forget how long the exposures were, or the number of frames...maybe 10-20 at 30 secs or so...not real sure but that would be common...maybe longer. My image would be rotated to our left, you can see the "y" shape of stars, and the triangle of stars in the hub...as well as some "globby" features. This was from 9-27-2018. It was an awesome night, if I remember. So any galaxies, with so many stars, with so many planets! I can't imagine how many! The "use a zoom tool" link is an overwhelming view. Looks difficult to call interstellar space empty. Maybe intergalactic now. Any bright spot with radiating spikes will be a star in our Milky Way galaxy. Any that does not have them should be associated with M33. (There are lots of examples of both throughout the image.) The bright spot in your close-up seems to be the central region of M33 -- not an individual star. Astounding image!!!! Wow just WOW!!! So much detail .I esp like the figure 8ish curly star patterns around 9:00 in the outer arm. The distances to stars and galaxies is mind melting.The closest star in The Milky Way is incredibly far away....our galactic core? Ridiculously distant.Our neighboring galaxies? Galaxies "out there" ? Unfathomable distances ...Sure we can throw numbers at them...analyze their light frequencies..monitor gravitational waves....dang..fantastic achievements! But frustrating still!!!! I want to touch them! The Triangulum Galaxy has at least an order of magnitude less stars than the Milky Way and two orders of magnitude less than Andromeda. These numbers are hard to grasp when already in this image 10 to 15 million individual stars are visible. Amazingly, running the math, the number stars visible in the original image are only about one tenth of a percent of the stars in this galaxy. (However, I find it hard to believe that there is an order of magnitude difference between the Milky Way and M31.) And even the hi-res version of this image shows only a fraction of those 10 – 15 million stars, at it has only 9 million pixels. Would all the stars have diffraction spikes if they could be resolved? All the stars do have diffraction spikes. As do the extended sources like galaxies and galaxy cores. There just aren't enough photons being diffracted to rise above the instrumental noise floor and be visible. ALL Hubble observed stars produce unresolved Airy disk images with accompanying diffraction spikes (caused by inference from the struts holding the convex hyperbolic secondary mirror). Overexposure of the brightest stars turns those Airy disks into wide circles with noticeably bright diffraction spikes. Thanks, Boomer, your image gives a very helpful way to relate to the Hubble image. I too, like that "one-eyed puppy-dog" in the Hubble image (the Zoom tool link is awesome). So very blue, I guess it must be a reflection nebula. NGC 604, giant stellar nursery. I guess that the blue nebula at top right might be the huge emission nebula NGC 604. The largest star forming region in this galaxy, a patch known as NGC 604, is bright enough to be visible in small backyard telescopes under good conditions, and offers you a chance to see for yourself a star factory in a galaxy some 3 million light years away. How big is NGC 604? It’s 1,500 light years across, about forty times larger than the famous Orion Nebula (M42) and about as large as the Orion Nebula is distant from us. It’s also some 6,000 times brighter than M42. If NGC 604 replaced the Orion Nebula in our galaxy, it would shine as bright as the planet Venus and its light would fill a patch of sky as large as your outstretched hand. 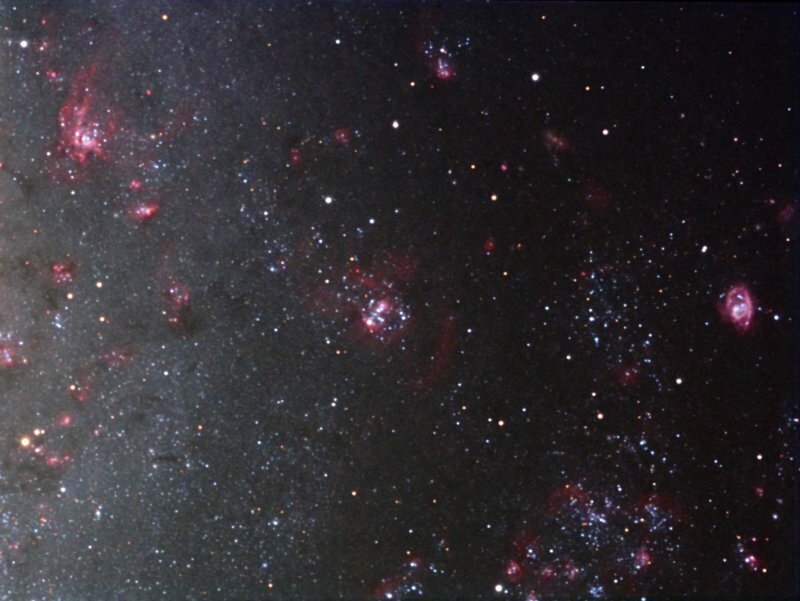 NGC 588 (left), NGC 592 (center) and NGC 595 (right). It could be that the blue nebula at top right in the APOD is one of these nebulas instead: NGC 588 at left in the picture at left, NGC 592 in the center and NGC 595 at right. I think it is NGC588... in your image it is sideways...the "top" or "Ears"...are on the right side... but it does show that it seems to be an emission nebula...maybe today's image is a bit false colored? It is interesting that there are soooo many Dwarf Galaxies close by us... might there not also be D.G. 's around other galaxies that we simply don't see due to lack of brightness?? ?